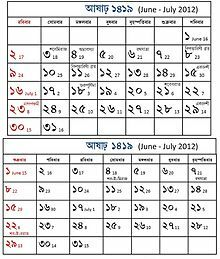 The Bengali Calendar or Bangla Calendar (Bengali: বঙ্গাব্দ, lit. 'Baṅgābda') is a luni-solar calendar used in the Bengal region of the Indian subcontinent. A revised version of the calendar is the national and official calendar in Bangladesh and an earlier version of the calendar is followed in the Indian states of West Bengal, Tripura and Assam. The New Year in the Bengali calendar is known as Pohela Boishakh. ^ a b c d e f Syed Ashraf Ali (2012). "Bangabda". In Sirajul Islam; Ahmed A. Jamal (eds.). Banglapedia: National Encyclopedia of Bangladesh (2nd ed.). Asiatic Society of Bangladesh. ^ "Google Doodle Celebrates Pohela Boishakh in Bangladesh". Time. Retrieved 17 April 2017.